This incredible photograph was taken by Gary Brink (1/800, ƒ/9, ISO 200, 135 mm) on May 29, 2011, at the Holland State Park in Michigan, USA. 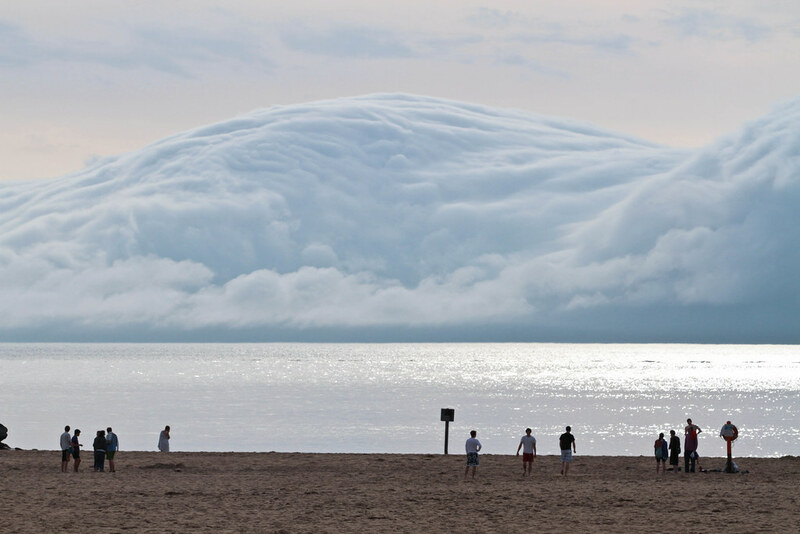 The incredible cloud formation formed on Lake Michigan just off the beach. Holland State Park features an expansive, sandy beach along Lake Michigan, two large campgrounds and a beautiful view of sailboats and sunsets. The park is divided into two separate units; one along Lake Michigan and the other along Lake Macatawa. The park was acquired from the City of Holland in December 1926. Since then it has been intensively used for its great beach and excellent campgrounds. The Park is known for its swimming beaches on Lake Michigan and Lake Macatawa. The Ottawa County bike trail runs through the park and connects you to more than 25 miles of paved roadside trails. New to Holland State Park is the dune walk stairway and hiking trail though the Lake Macatawa Unit and historical Ottawa Beach. For more information please visit the Michigan Department of Natural Resources.